When Jesus began to teach the people by the river Jordan, a few young men came to him as followers, or disciples. Some of these men were Andrew and John, Peter and Philip and Nathanael. While Jesus was teaching near Jerusalem and in Samaria, these men stayed with Jesus; but when he came to Galilee, they went to their homes and work, for most of them were fishermen from the Sea of Galilee. One morning, soon after Jesus came to Capernaum, he went out of the city, by the sea, followed by a great throng of people, who had come together to see him and to hear him. 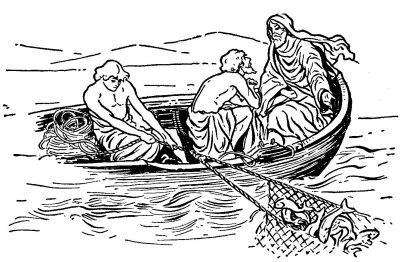 On the shore were lying two fishing boats, one of which belonged to Simon and Andrew, the other to James and John and their father Zebedee. The men themselves were not in the boats, but were washing their nets near by. They did as Jesus bade them; and now the net caught so many fishes that Simon and Andrew could not pull it up, and it was in danger of breaking. They made signs to the two brothers, James and John, who were in the other boat, for them to come and help them. They came, and lifted the net, and poured out the fish. There were so many of them that both the boats were filled, and began to sink. From that time these four men, Simon and Andrew, James and John, gave up their nets and their work, and became disciples of Jesus. On the Sabbath, after this, Jesus and his disciples went together to the synagogue, and spoke to the people. They listened to him and were surprised at his teaching; for while the scribes always repeated what other scribes had said before, Jesus never spoke of what the men of old time had taught, but spoke in his own name, and by his own power, saying, “I say unto you,” as one who had the right to speak. Men felt that Jesus was speaking to them as the voice of God. Then the evil spirit threw the man down, and seemed as if he would tear him apart; but he left the man lying on the ground, without harm. After the meeting in the synagogue, Jesus went into the house where Simon Peter lived. There he saw lying upon a bed the mother of Simon’s wife, who was very ill with a burning fever. He stood over her, and touched her hand. At once the fever left her; she rose up from her bed and waited upon them. At sunset, the Sabbath day was over; and then they brought to Jesus from all parts of the city those that were sick, and some that had evil spirits in them. Jesus laid his hands upon the sick, and they became well; he drove out the evil spirits by a word, and would not allow them to speak.